The Guardian Angels School curriculum follows the Graded Course of Study for each subject as provided by the Archdiocese of Cincinnati. You can find more information, based on grade levels and subject areas, by clicking here. Our school program is a dynamic blend of current, research-based educational practices, incorporated with proven traditional curricula and methods. The following descriptions give a brief look at the major subject areas. Guardian Angels School strives to provide an environment which prepares each student for a culturally diverse world by proclaiming values rooted in the Gospel of Jesus Christ. Values of respect and service cross all curriculums and provide the context in which our children learn. Daily prayer and daily religion classes are the forum for our students to learn about their faith. Sacramental preparation in second grade for First Reconciliation and First Communion, and in seventh grade for Confirmation, are important elements of the religion program. The mathematics curriculum is strongly rooted in developing and mastering basic skills while constantly challenging students to understand patterns, use problem-solving and reasoning skills, and seek answers to why, not just how. In the primary grades, teachers emphasize basic operations, word problems, time, and money. While students in the intermediate grades work to master operations, they are introduced to algebra and geometry concepts. 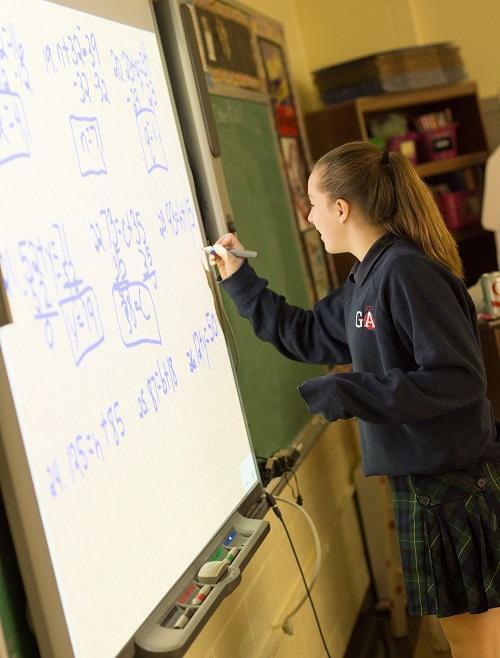 In junior high, students prepare for high school with great emphasis on analyzing and describing patterns, number theory, Elementary Algebra 1, and Plane and Solid Geometry. All grade levels utilize Accelerated Math to allow students to master and strengthen skills at their own pace. The study of language arts encompasses reading, writing, and speaking with proper grammar and English. This begins with a phonics program in kindergarten. Primary grades read in a variety of settings, including; class, small groups, individual and teacher-led groups. The Sitton Spelling Program and Zaner Bloser Handwriting methods are used in the classroom. Intermediate grades begin to use different genres to strengthen vocabulary and understanding of the language. Students also learn the writing process and develop good organization and planning methods for strong, coherent writing. In junior high, students read a blend of classics and modern literature daily. Students also keep journals and writing logs to sharpen grammar and writing skills. All students take STAR Literacy Tests at least twice a year to track reading levels. A state-of-the-art science lab complements the inquiry-based science curriculum across all grade levels. An emphasis on the scientific method drives the broad-based science program with age-appropriate exercises in observation, demonstration, and experimentation. The curriculum covers physical science, life science, earth science, chemistry, and physics at different points in the grade levels. The primary grades are introduced to map skills and learn the concepts of community, laws, and historical individuals. Fourth graders learn United States geography, land, government, and economics while the fifth grade concentrates on geography and the ancient world. Our sixth grade students study the growth of civilization through modern World History and geography. 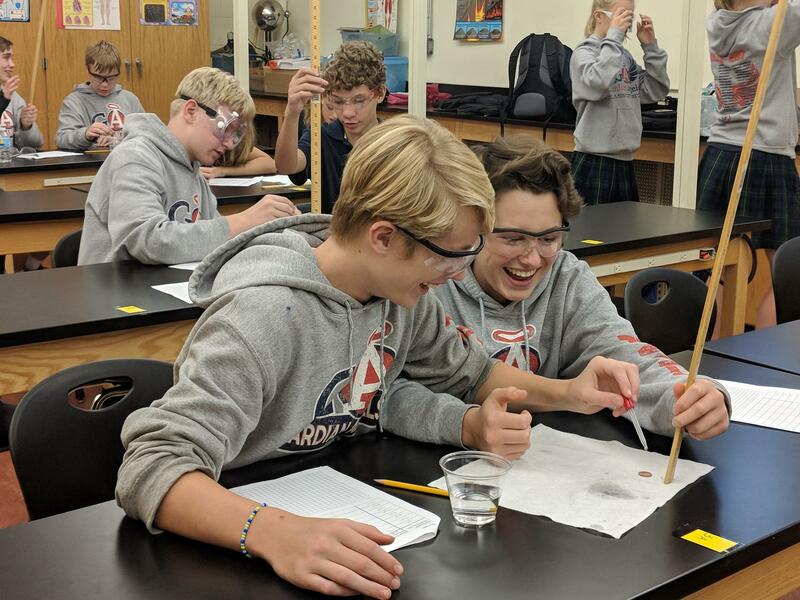 Seventh graders study American History, and eighth graders learn about the Constitution, the election process, stock market and our legal system. Specials are available to Guardian Angels students on a weekly basis through a rotation schedule. These classes include Art, Music, Physical Education, Spanish, and Library. 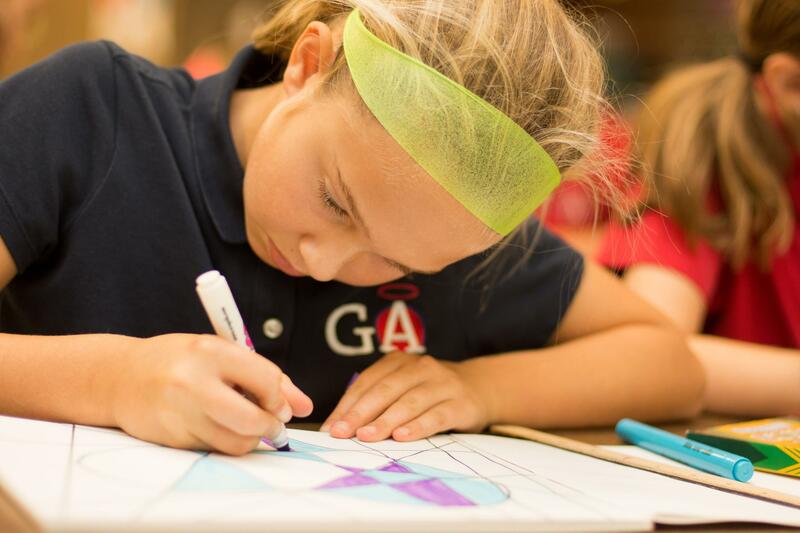 Students learn about the elements and principles of art, color theory, different styles and periods of art, and influential artists and cultures. Many different art mediums are available for the students to discover new ways of creating their own masterpieces. Each spring, there is a school-wide art show that displays the best creations from the year. Each student chooses their favorite two pieces of work to feature in the show. Guardian Angels has the longest running music program in the Archdiocese. The program offers every student an opportunity to be involved at any age. Primary students focus on the basics; rhythms, vocal sounds and types, and movement. These students are also introduced to Orff Instruments. Students learn how to read music and play a recorder in the fourth grade. Fifth grade is the first opportunity to join beginning band. 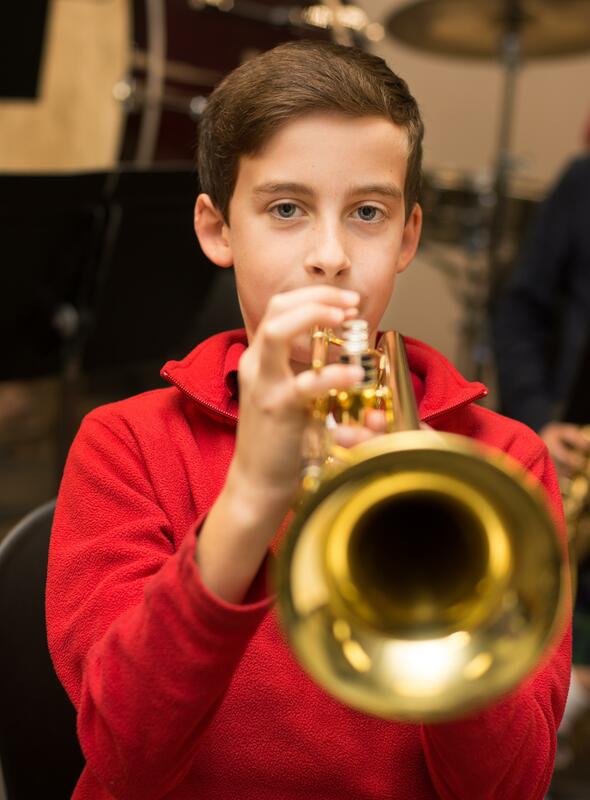 Students in grades 6-8 have three choices of music: Band, Chorus, or General Music. The music program produces two concerts a year, a Christmas Concert and a Spring Concert. A Spring Musical is held each year starring students in grades 5-8. Gifted musicians make up the Jazz Group who also perform at events outside GA. 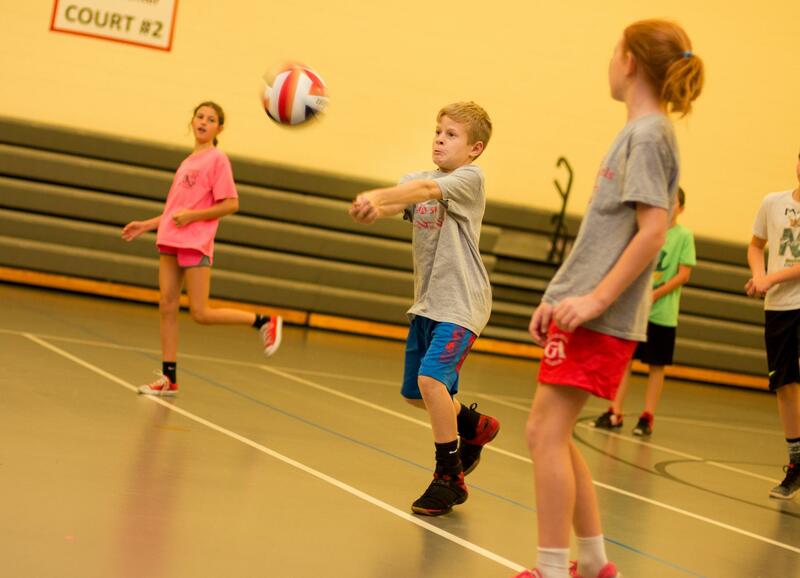 Physical Education classes focus on movement education, skills development, fitness and safety, and games. The primary classes focus on motor skills. Students in grades 4-8 are involved in fitness testing to gauge their physical development. Guardian Angels has a large supply of sports equipment to involve students in a variety of sports and engage the children with a variety of interests. Classes wrap up the year with a school-wide field day. Students in kindergarten through sixth grade take Spanish classes once a week. Much of the curriculum in these grades is focused on vocabulary and pronunciation and how to use what they’re learning in everyday life. The students use games and create projects to help enforce what they learn from week to week. In 7th and 8th grades, students attend Spanish three times a week. These students work on grammar, sentence structure, and practice conversational Spanish as a group. Students in the upper level grades have more extensive projects. Sixth graders were involved in a project where they presented their own news updates that included introducing themselves, giving weather updates and providing sports headlines, all in Spanish. Guardian Angels has a wonderful library stocked with a variety of books for children of all ages. Students in kindergarten through eighth grade have access to the library. The librarian leads story time for the primary grades that involves books, music, and artwork. Story times are important to help enhance early literacy skills that promote a lifelong love of reading. Using different elements helps keep young students involved and taps into a variety of methods of learning and comprehension. Children in all grades are able to check out books from the library to take home. Students can access the library catalog from home, making it easy to see what is available, create their own book lists, and plan ahead for future reading. The library also hosts two Scholastic Book Fairs during the school year.